Unionville fullback Austin Hoffman-Reardon runs for his third and final touchdown during a 42-7 defeat of Kennett on Oct. 2. On a night when everything came together for Unionville, it was not difficult to recall that six nights before, very little did. They found that weapon, in the person of Austin Hoffman-Reardon, who ran for three touchdowns in a 42-7 rout over Kennett, before a crowd of 1,000 at Kennett Stadium. On the opposite side of the ball, the Unionville defense completely shut down Kennett's option offense, and in particular, the running threat of quarterback Nick Dunlevy. After a scoreless first quarter, a Kennett punt began the Unionville drive on the 15-yard-line, when carries by running back Brendan Boyle for 9, 16 and 4 yards was followed up by a nine-yard strike from quarterback Alex Pechin to receiver Elan Nash. After two carries by running back Brendan Boon got the ball to the Kennett six yard-line, Hoffman-Reardon finished off the 85-yard scoring drive by blasting through the hole, a carry that led to a fumble which was picked up by Boon in the end zone, with 5:54 left in the half. After a fourth-and-one rush by Dunlevy was stopped on the Unionville 36 yard line, Hoffman-Reardon scored the first of his three TDs on a one-yard, untouched jog with 1:17 remaining in the half. With Unionville holding to a 14-0 lead at the start of the second half, Hoffman-Reardon followed up his first score with a 12-yard touchdown run with 9:40 left in the period to give the Indians a 21-0 lead. On Unionville's next possession, Hoffman-Reardon bolted 8 yards for his final TD of the night, with six minutes remaining in the third quarter. Down 28-0 deep into the third, Kennett mounted its first offensive threat of the game, highlighted by a 46-yard run by running back Miles Robinson that moved the ball to the 13 yard-line of Unionville. Two carries by Matt Boessman got the ball to the four yard-line, but on fourth-and-one, Dunlevy's roll-out keeper to the right side was stopped for a five-yard loss. 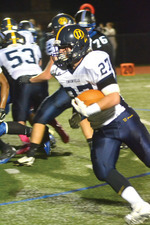 The stop was indicative of the stranglehold Unionville had on Dunlevy, who was held to one yard rushing on 15 carries. 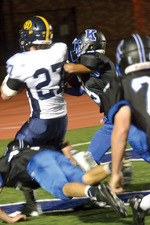 Kennett's only score of the game came on a slash-and-burn touchdown run by Robinson at the end of the third quarter – a play made even more spectacular when Robinson, seeing no daylight to his left, suddenly reversed field and marched 60 yards for the score. 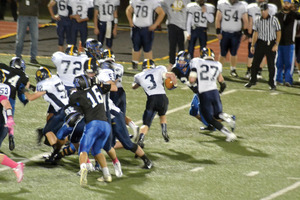 On the ensuing kick-off, Nash ran the kick back to the Kennett 14-yard line, setting up a Pechin pitch to Boyle, a pass to Tim Ziedman that got the ball to the one yard-line, and a one-yard touchdown run by Boyle with 10:07 left in the third quarter to give Unionville a 35-7 lead. Unionville tacked on its final score in the fourth quarter, when with 3:51 remaining in the game, back-up quarterback Jason Hagan found receiver Brody Fitzgerald in the corner of the end zone for a 12-yard scoring pass. Unionville [4-2, overall] will play host to Octorara Area on Oct. 10 for its homecoming game, while Kennett [1-5, overall] will host Coatesville on Oct. 10.